From Wei et al Oncotarget 2017. How bits of two different image can end up inside a third one: Only Tonji hospital can explain. Only they won’t. The posts on Chinese social media platform Weibo sharing the PubPeer evidence, the statement released for internal use only by the Tongji Hospital, they all were deleted in the matter of hours, but there are backups. The university hospital sees only a foreign conspiracy, will the journal follow this thinking? Some papers have been already corrected previously, like Gao et al PLOS One 2014, where duplicated images were replaced. Will there be any new corrections of literature? It is about recurrent bits of images, from immunohistochemistry and other microscopy, western blots, flow cytometry, or even photographs of cell culture wells like in Wang et al PLOS One 2012. Duplicated loading control bands, in Zhang et al Oncology Letters 2013. Can’t be important, right? The story was discovered by my pseudonymous contributor TigerBB8, who now shares this guest post with you. Even flow cytometry gets duplicated, but with different numbers, in Huang et al J Exp Med 2010. In 2017, the prominent scientist Dr. Ding Ma, at Tongji Hospital at Huazhong University of Science and Technology in Wuhan was elected as Academician of the Chinese Academy of Engineering, which is the counterpart to a membership at the National Academy of Engineering of the United States. China does not have a National Academy of Medicine yet, therefore, Chinese Academicians working in that field are either elected to the Chinese Academy of Sciences or to the Chinese Academy of Engineering. One year later, on December 18, 2018, a pseudonymous PubPeer user Lotus Azoricus posted their comments suspecting image irregularities for 17 papers, all from the same group in China, a group led by the Academician Published between 2005 and 2017, in English and in international journals, the papers from the Ma lab were all on cancer-related research, with Ma as the common corresponding author. The news soon caught attention of some micro-bloggers on Chinese internet, specifically, on Weibo, a social media platform similar to Twitter (which is blocked in China). Several Weibo bloggers reported the news while posting a couple of pictures flagged by PubPeer commenters, those posts received a couple of thousands reads. One Weibo blogger re-posted the screenshot of these responses and made fun of their poor English, questioning how authors with such poor understanding of English could have drafted their original papers in English. The team of Dr. Ma remained silent on Chinese media. In order to save China’s limited healthcare resources, Academician Ding Ma strongly advocates the establishment of a cervical cancer early warning and vaccination system that is more appropriate for the situation in China. [According to Ding Ma, -TBB8], only the 5% of high-risk Chinese individuals need cervical cancer vaccination, rather than following the immunization program that recommended to the entire population that the US vaccine manufacturers strongly promote, bringing serious damage to the vested interests of the United States. Once Academician Ding Ma’s team releases their opinions and papers on the Chinese cervical cancer prevention and treatment system, it will trigger counter-attacks from newspapers, public accounts of social media, etc. On April 28, 2018, an overseas vaccine manufacturer received conditional approval to market their HPV9 vaccine in China; on May 18, 2018, Academician Ding Ma, published an article, co-authored with the China FDA (CFDA) and titled “Interpretation of the Conditional Approval of Human Papillomavirus (HPV) 9-valent Vaccine in China” on China Pharmaceutical News (an official newspaper by CFDA). In early December 2018, Academician Ding Ma submitted an article to NeiCan of the Xinhua News Agency’s Outlook Weekly [Refer here for description of this relatively secret internal reference reports edited by Xinhua News Service for limited distribution -TBB8] titled “The conditional use of the nine-valent human papillomavirus (HPV) vaccine in China”. In the early morning of December 18, 2018, the US Pubpeer website published a number of anonymous articles, questioning and maliciously attacking research papers from Academician Ma’s team. This is yet another network penetration of Western ideology, which seriously threatens the ideological security on China’s internet. These Pubpeer articles were reposted by the domestic personal micro bloggers (Banhu and Baiyixianfan) and YiXueJie – Medical Community website. If the public sentiment caused by this malicious attack spreads, many cutting-edge research projects which are of the world leading role at Tongji Hospital Cancer Biotherapy Center will be seriously damaged, especially when right now is the critical moment at the dawn of establishing the Chinese cervical cancer early warning system and the research and development of HPV vaccine specifically for Chinese people. The damaging effect will affect the entire field of biotherapy in China, and, even more serious, destroy the public’s confidence on China’s healthcare service. Immediately after the incident, the Academic Committee of Tongji Hospital launched an investigation. The group of experts concluded unanimously that there was no academic fraud involved in the content of the papers from Ma’s team that had been maliciously attacked. There did exist some oversight in the presentation of scientific research data, and the recommendation from the Committee was that more rigorous and meticulous way should be implemented in the future work“. Tongji Hospital misrepresents the US CDC recommendations. HPV (human papilloma virus) vaccination are namely advised not to the entire population, but to children who are 11 or 12 years old, teenagers, women up to age 26, men up to age 21, and other specified groups. 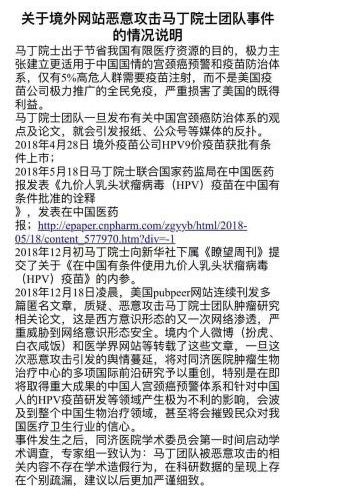 Also, Tongji hospital alleges that US pharmaceutical companies which manufacture HPV vaccines, especially the one which received Chinese FDA’s clearance to enter Chinese market, was behind the malicious attack to Dr. Ma on Pubpeer. Although Tongji Hospital did not specify which company it referred to, some of the Weibo bloggers pointed out that this must be the U.S. based drug maker Merck & Co. Inc., based on a press release in May 2018. At the end of the statement, Tongji Hospital states that they had already completed an investigation regarding the Pubpeer allegation of suspected image frauds involved in Dr. Ma’s papers, the matter of only 2 days which passed between the PubPeer publication of comments and the released statement. Their conclusion was that none of the allegations was solid. All the flagged figures were nothing but honest mistakes. Within hours of the appearance of the statement, all those bloggers who reported the PubPeer evidence received serious warnings from the Weibo admin, with one of them was suspended for 30 days, and all relevant posts were deleted. Next day, on 21 December 2018, Twitter account @fangshimin shared this incident, his tweet was re-posted on Weibo on 22 December 2018 (by a Twitter bot) and has remained intact, so far. From Han et al J Immunology 2009. How can this image duplications can happen by honest mistake? China is a big market for journals, so don’t expect any of them to pull this fake stuff out of circulation on their own. This is why we need Pubpeer, and why all practicing researchers should use the browser plugin that identifies fake stuff like this so it can be cited appropriately – or not. The Chinese can base their health care system on fake research if they want, as is their democratic (or whatever) right. They can also promote fakers over real scientists if they want. But the essentialist sword cuts both ways. 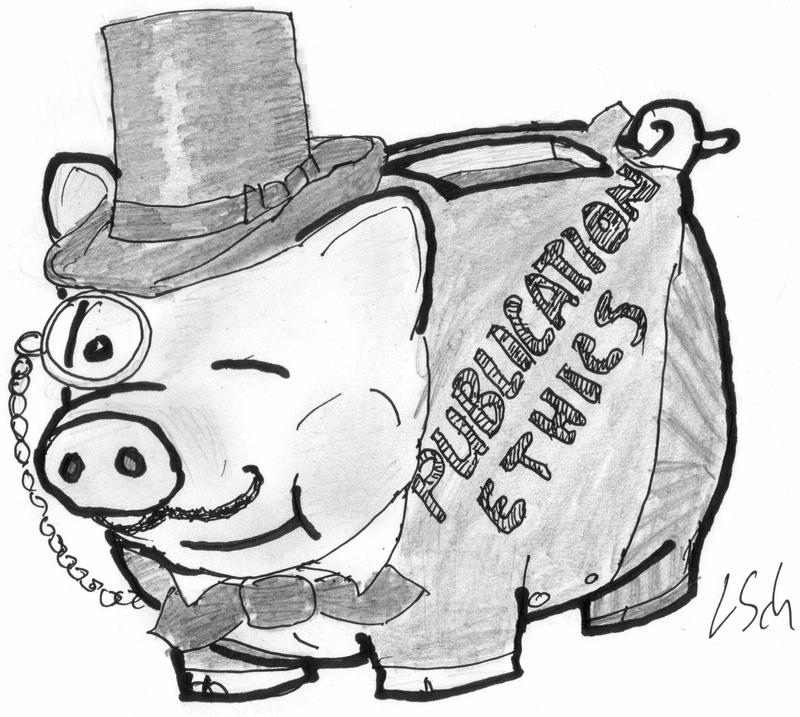 If every criticism is a malicious attack, then every instance of fakery is proof of an illegitimate, politically driven research enterprise aimed at lining the pockets of the elite while millions suffer needlessly. The database at RetractionWatch shows two retractions for Ding Ma; one from a Chinese journal in 2003, and one in 2017, of a 2014 paper, because of self-plagiarism. Full credit to Dove Press for that one. In fact the retracted paper hadn’t even been flagged on PubPeer, only the one that provided the recycled diagram. To be fair their response is like Cardiff University’s (Wales, U.K.). There has, however, been a 2019 retraction of a 2011 paper with Prof Wen Jiang as co-author. How to explain? The retraction notice gives detailed reasons for the editors retracting the article. The editors do not mention maliciousness of commentators as a reason. No, not accurate. It took Cardiff many months to reach the not-guilty verdict while Tongji Hospital was way more efficient. No one can beat that high efficiency, two days for an investigation of 17 papers. Perhaps someone with a better understanding of the Chinese legal system can comment, but I thought that if you called somebody a lying cheat it wasn’t slander if your opinion was backed by evidence. In this case the evidence is provided by public analysis of the output of the described individual. As for anonymity of accusations, we have here a clear example of the utility of that arrangement. Indeed if I was Monsanto, I’d be mobilizing the lawyers by now, unless of course they have billions invested in China already. You mean Merck, rather than Monsanto? I guess because the statement was sort of internal communication, Merck has no chance. Also, Merck has big investment in China. Of course they will blame the West. Dictatorships need to demonize an enemy. lose in the long run. Tongji Hospital and show some responsibllity in this case. The Google Translate version is quite grammatical and readable… I don’t know whether Translate is getting better, or whether it was helped by the well-structured punctuation in the original. Of course I can’t speak for the accuracy of the translation. It greatly exaggerates the rate of undesired side-effects reported with Gardasil: “The incidence of serious adverse reactions (SAE) was 0.2% to 0.3%, mainly neurotoxicity”. Also, vaccination should be “concentrated in high-risk susceptible population (about 5% of the age-appropriate population), and gradually develop a precise vaccine vaccination strategy based on the genomics research of Chinese population.” Enquiring minds are wondering how this “high-risk susceptible population” is defined… a family background of promiscuity? It is easy enough to read between the lines. Chinese authorities understand that there is a demand for Gardasil-9, but they are reluctant to see large amounts of money flowing to Merck. Hence they are preparing their audience for a locally-made vaccine, which will be cheaper and lack the imaginary side-effects. How closely it will be based on Merck’s proprietary production techniques remains to be seen. Therefore (goes the reasoning) there must be a simple test distinguishing the ‘progressors’ from the ‘non-progressors’, and only the former need to be vaccinated (accepting HPV as a part of life rather than trying to eliminate it from the population). Through the Chinese women’s genetic background big data and susceptibility locus research, combined with the deep analysis of cervical cancer family aggregation, establish a Chinese cervical cancer early warning and prevention and control system, accurately vaccinate high-risk susceptible populations to reduce the risk of disease, for the country and individuals Avoid the huge amount of health expenditure and achieve the best effect of the cost of disease prevention and control. Ding Ma has nobly taken on the barely-paid task of designing that test. In this interview, Ding Ma said clearly “99% of people are vaccinated to prevent the cervical cancer with only an incidence rate of less than 4%. This is only to benefit foreign companies”. Ah, I see; Ding Ma already has the genetic markers. [He] led the team to collect samples from dozens of medical institutions in Zhejiang, Shanghai and Hunan. In the past three years, a total of 16484 Chinese Han population samples were tested and 11 new cervical cancer genetic susceptibility mutation sites were discovered. After that, the team collected the cervical cancer family in the country for testing and analysis, which confirmed the genetic susceptibility of cervical cancer: HPV infection is only an external cause of cervical cancer, and internal hereditary nature is the root cause of the disease. In August 2013, the research results of this project were published in the international top professional journal Nature Genetics with an impact factor of 35.8. Are his results more reliable than the average GWAS? Any thoughts from the experts? I can’t judge whether these results are reliable or not, but given the total lack of efficacy of Gardasil in cervical cancer prevention, a combined strategy should not do better. Ah, so with the help of Google translate and various pronouncements from respected academician and data-faker Ma, I begin to see the outlines of a policy here. It’s too expensive to use capitalist foreign vaccine, so we genetically screen potential recipients to identify those who may benefit from it. We are absolutely certain we can do this because results were published in a journal with impact factor 35.8. Sounds wonderfully cost effective, provided the real purpose is to gathering DNA information from half (or somewhat less owing to local cultural peculiarities) of the Chinese population. Given the genetic uniqueness of that population (or at least the Han, who are all that really matter), it is also justified to make a slightly modified vaccine tailored for them without worrying about details like intellectual property rights, patents, etc. This is, of course, only a stopgap measure until we can simply CRISPR out all of the unwanted genes. Oh brave new world, that has such people in’t! Anybody can see that cervical cancer incidence has not decreased in young women in the countries where vaccination has begun ten years ago. The Cochrane review has been criticized by Peter Gotzsche, who, in turned, has been fired from Cochrane. Good subject to investigate. RESULTS: The average follow-up was 3.6 years (maximum of 4.9 years). In the population that was negative to 14 HPV types, vaccination was up to 100% effective in reducing the risk of HPV16/18-related high-grade cervical, vulvar, and vaginal lesions and of HPV6/11-related genital warts. In the intention-to-treat group, vaccination also statistically significantly reduced the risk of any high-grade cervical lesions (19.0% reduction; rate vaccine = 1.43, rate placebo = 1.76, difference = 0.33, 95% confidence interval [CI] = 0.13 to 0.54), vulvar and vaginal lesions (50.7% reduction; rate vaccine = 0.10, rate placebo = 0.20, difference = 0.10, 95% CI = 0.04 to 0.16), genital warts (62.0% reduction; rate vaccine = 0.44, rate placebo = 1.17, difference = 0.72, 95% CI = 0.58 to 0.87), Pap abnormalities (11.3% reduction; rate vaccine = 10.36, rate placebo = 11.68, difference = 1.32, 95% CI = 0.74 to 1.90), and cervical definitive therapy (23.0% reduction; rate vaccine = 1.97, rate placebo = 2.56, difference = 0.59, 95% CI = 0.35 to 0.83), irrespective of causal HPV type. CONCLUSIONS: High-coverage HPV vaccination programs among adolescents and young women may result in a rapid reduction of genital warts, cervical cytological abnormalities, and diagnostic and therapeutic procedures. In the longer term, substantial reductions in the rates of cervical, vulvar, and vaginal cancers may follow. CONCLUSIONS: High-coverage HPV vaccination programs among adolescents and young women may result in a rapid reduction of genital warts, cervical cytological abnormalities, and diagnostic and therapeutic procedures. In the longer term, substantial reductions in the rates of cervical, vulvar, and vaginal cancers. Same observations can be made in other countries. Some people say that Gardasil increases cervical cancer incidence. For Better Science should pay attention to this matter. Someone on Ding Ma’s team fabricates images in photoshop, finding this to be easier than obtaining an actual image to illustrate some point. None of the authors show any interest in finding out who that person is, or how much other evidence has been forged. Sadly, this destroys the credibility of all their results.